India HCP market posted quarterly shipments of approx. 1.1 million units in 2018Q3, a Quarter-on-Quarter growth of 25.6 percent, as per latest IDC Asia Pacific Quarterly Hardcopy Peripherals Tracker , CY2018Q3. While there was a Year-On-Year decline of 1.7 percent, it can be primarily attributed to the strong demand for laser printers post GST implementation last year. 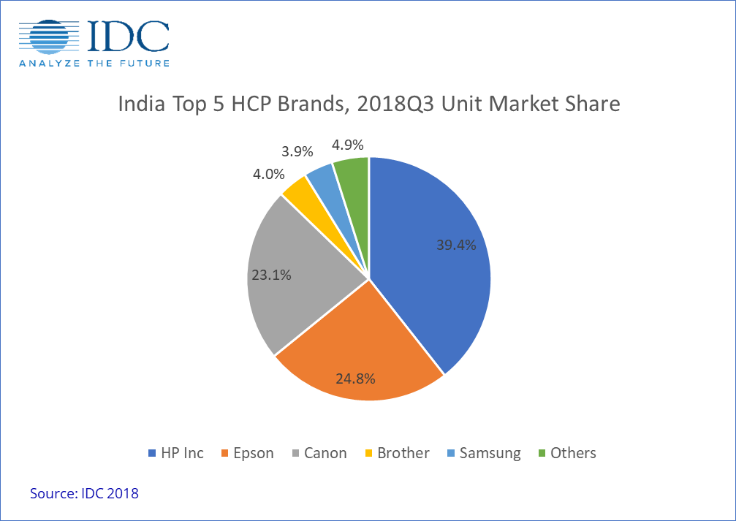 Inkjet printer shipments grew by 5.5 percent Year-On-Year with a contribution of 55.3 percent to overall India HCP market, the highest ever recorded. Growth in inkjet printer shipments was led by Ink tank printers which recorded Year-On-Year growth of 12.9 percent. While the overall laser printer market declined Year-On-Year, due to the government’s efforts on enforcing restrictions on the refurbished copier market, the laser copier market registered a healthy Year-On-Year growth of 37.5 percent. Epson remained at 2nd position in the overall HCP market by clocking 20.7 percent quarter on quarter growth and it also continued to hold its leadership in inkjet segment with a unit share of 40.2 percent and a 21.8 percent quarter on quarter growth. The growth is primarily attributed to Epson’s increased shipment to the online channel and LFR stores. The sales of a few top selling models picked up amidst the upcoming product portfolio refresh. Canon recorded year on year growth of 24.5 percent and maintained its 3rd position in the HCP market with the help of its Inkjet and the Laser Copier segment. In the copier segment it maintained its leadership position with 28.4 percent unit market share. The Government’s stricter regulations on the RC market coupled with Canon’s increased focus on corporate segment helped to maintain its dominance in copier market. In the Inkjet market, Canon saw a strong year on year growth of 55.2 percent because of addition of new channel partners and change in channel strategy, which included attractive channel distribution and schemes, as well as strong push for online sales. Canon especially focussed on its Ink tank models through channel schemes.